Talvisota is a Finnish War Strategy game which was released on the MSX back in 1987. It is about Finland’s war against Soviet Union in 1939-1940, Talvisota means Winter War. Finnish magazine Trioposti first mentioned the game and details that Triosoft were considering doing a C64 conversion. 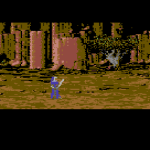 Now Triosoft have done C64 work before, and a single game exists in Gamebase which they published, so it could well be that something was started. We know little more apart from that it could be by the same MSX developers, so who are we looking for and what are we looking for exactly?… Could this game have been completed ? We learn that Triosoft is still operating, but no longer publishing games. We hope therefore to learn more about this game! We need lots of info on this one – so any Finnish viewers, please help!